As a new school year approaches, it seems like the right time for a refresher course on Pennsylvania school bus laws. According to PennDOT, each year, over 1.5 million students travel over 400 million miles of Pennsylvania roadways during the school year. That is a lot of roadway and potential for accidents. In the interest of student safety, be sure to follow the Pennsylvania school bus laws. If you are following a school bus, or are about to pass one from the opposite lane, you must stop if the bus’s lights are flashing and the stop sign has been extended. A buffer zone of 10 feet must be given behind and in front of the bus to ensure that students can safely exit and cross the street if necessary. Only after the bus has stopped flashing its lights and retracted its stop sign, can you proceed to pass the bus. This means, even if you think all of the children have safely crossed, you cannot pass unless the school bus driver has signaled that it is safe to proceed. These rules must be followed at intersections as well. Even if your road does not have a posted stop sign, you must stop at the intersection if a school bus has stopped with flashing lights and stop arm extended. The only exception to the Pennsylvania school bus law comes into effect if there is a physical barrier separating traffic lanes. In these cases, vehicles travelling the opposite direction of the bus do not need to stop if the bus’s lights are flashing. However, all traffic travelling behind and in the same direction as the bus must stop, even if the vehicles are in a different lane. 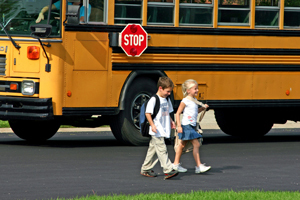 PennDOT estimates that over 1,000 motorists ignore Pennsylvania school bus laws every year. Disobeying the laws can result in a 60-day suspension and five points on your license, as well as a $250 fine. Worse, it can result in the death or injury of a child. For more school bus safety tips, check out Just Drive PA. If you or someone you know is injured in an accident, call on our team at Katherman Briggs & Greenberg for the Results You Deserve®. We’re here 24/7.